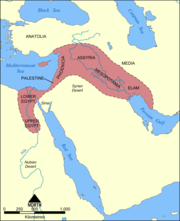 The Fertile Crescent ( Arabic,الهلال الخصيب )is a historical crescent-shape region in the Middle East incorporating the Levant, Ancient Mesopotamia, and Ancient Egypt. The term "Fertile Crescent" was coined by University of Chicago archaeologist James Henry Breasted. Watered by the Nile, Jordan, Euphrates and Tigris rivers and covering some 400-500,000 square kilometers, the region extends from the eastern shore of the Mediterranean Sea around the north of the Syrian Desert and through the Jazirah and Mesopotamia to the Persian Gulf. These areas correspond to the present-day Egypt, Israel, West Bank, Gaza strip, and Lebanon and parts of Jordan, Syria, Iraq, south-eastern Turkey and south-western Iran. The population of the Nile River Basin is about 70 million, the Jordan River Basin about 20 million, and the Tigris and Euphrates Basins about 30 million, giving the present-day Fertile Crescent a total population of approximately 120 million, or at least a quarter of the population of the Middle East. The Fertile Crescent has an impressive record of past human activity. As well as possessing many sites with the skeletal and cultural remains of both pre-modern and early modern humans (e.g. at Kebara Cave in Israel), later Pleistocene hunter-gatherers and Epipalaeolithic semi-sedentary hunter-gatherers (the Natufians), this area is most famous for its sites related to the origins of agriculture. The western zone around the Jordan and upper Euphrates rivers gave rise to the first known Neolithic farming settlements (referred to as Pre-Pottery Neolithic A ( PPNA)), which date to around 9,000 BCE (and includes sites such as Jericho). This region, alongside Mesopotamia (which lies to the east of the Fertile Crescent, between the rivers Tigris and Euphrates), also saw the emergence of early complex societies during the succeeding Bronze Age. There is also early evidence from this region for writing, and the formation of state-level societies. This has earned the region the nickname "The Cradle of Civilisation." As crucial as rivers were to the rise of civilisation in the Fertile Crescent, they were not the only factor in the area's precocity. The Fertile Crescent had a climate which encouraged the evolution of many annual plants, which produce more edible seeds than perennial plants, and the region's dramatic variety of elevation gave rise to many species of edible plants for early experiments in cultivation. Most importantly, the Fertile Crescent possessed the wild progenitors of the eight Neolithic founder crops important in early agriculture (i.e. wild progenitors to emmer wheat, einkorn, barley, flax, chick pea, pea, lentil, bitter vetch), and four of the five most important species of domesticated animals — cows, goats, sheep, and pigs — and the fifth species, the horse, lived nearby. These considerations are a major area of focus and analysis in the book Guns, Germs, and Steel.